Once I read that if a woman could give her daughter one bit of advice from the kitchen, it would be to add lemon zest to everything. I absolutely agree with her because it makes food taste fresh and is full of the phytonutrient limonene, which has extremely promising anticancer activities. If you’ve never tried it, add some lemon zest (I use a Microplane tool for a really fine zest) and juice to your chicken soup right before serving. You will be amazed. I also love to add it to baked goods like blueberry muffins. 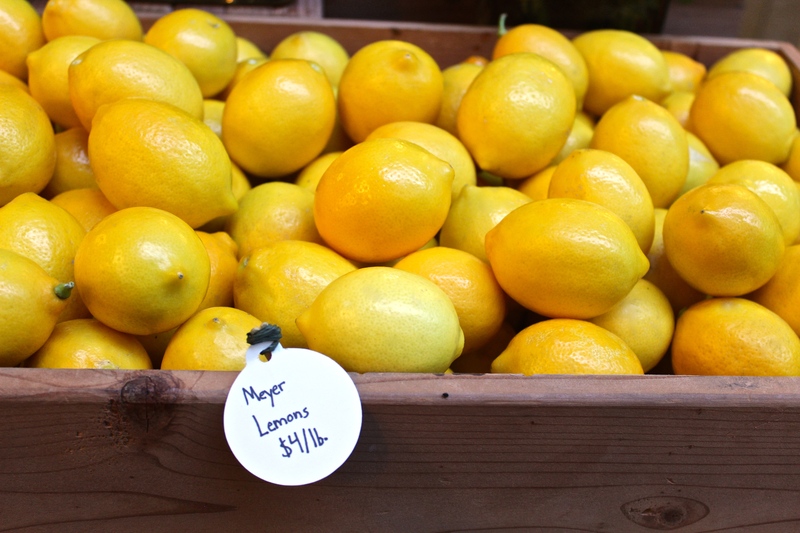 It is Meyer lemon season right now and I spotted this box of beautiful lemons at the Ferry Building in San Francisco this week. But if you live in a moderate climate, you don’t need to buy them. Just plant a tree and it will produce this tasty, healthful fruit for you throughout the year. In fact, a tree may bear as many as 3,000 lemons annually. I pick a big round yellow globe off our tree daily for green smoothies. We put the whole thing into the Vitamix because the majority of the limonene is in the white spongy insides. On day 18 of this 365 day project, I ate my daily five (including fresh pickled cauliflower, which I need to learn how to make). Did you enjoy yours?